Xi’an Famous Foods has seven locations in New York City, although the original spot in Flushing Queens and the spot in midtown don’t sell dumplings. I previously tried the lamb dumplings at Xi’an Famous Foods and to balance out my meat eating tendencies I recently went back to try out their vegetable dumplings. 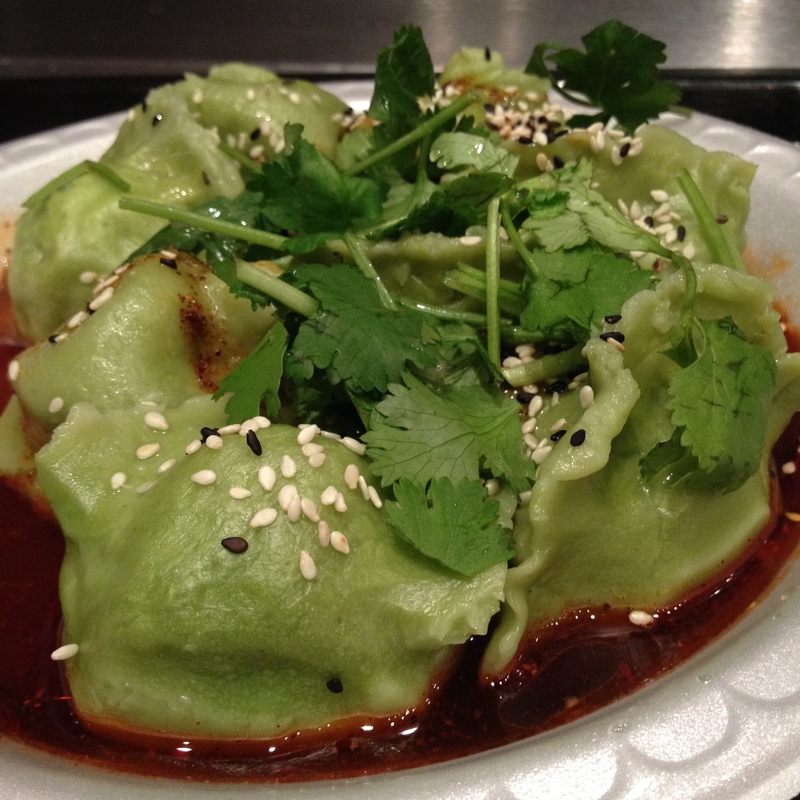 The Dumplings: The fresh boiled vegetable dumplings have green spinach juice infused dough wrappers and are stuffed with a giant wad of spinach, some glass noodles and a little egg (so vegetarian, not vegan) and come topped with black and white sesame seeds and cilantro and doused with spicy and sour sauce. These were some of the best vegetable dumplings I have tried, the spinach tasted fresh and alive and each dumpling is so packed with spinach that a serving of dumplings probably counts as your entire recommended daily intake of vegetables. The dumplings also make an excellent delivery vehicle for Xi’an Famous Food’s great sauce. 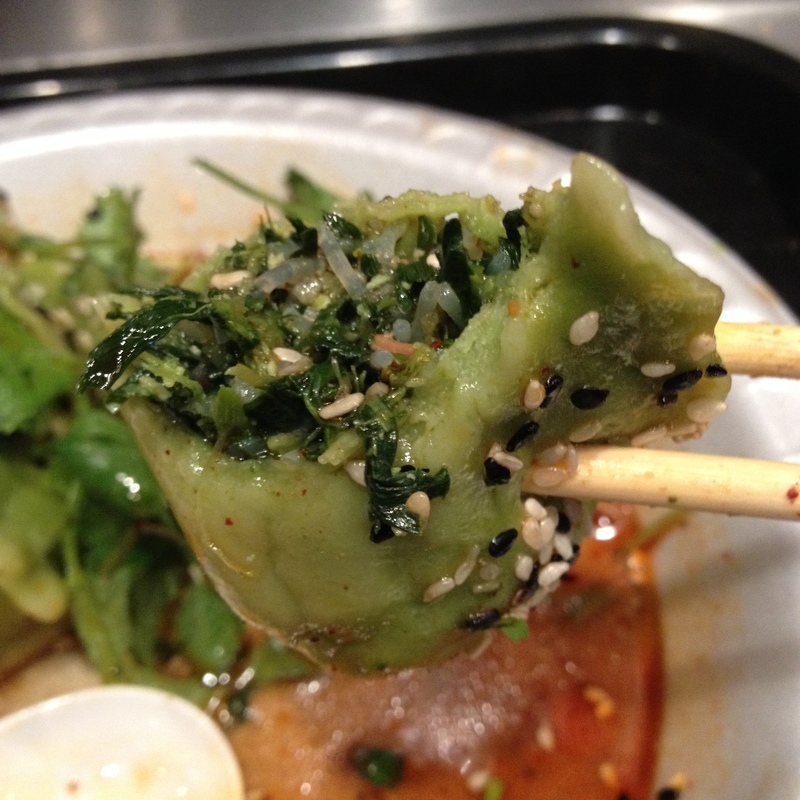 The best way to eat these dumplings is to bite off part of the wrapper and then spoon lots of sauce onto the spinach filling. The Dipping Sauce: The dumplings are served with Xi’an’s secret sauce poured over them – a spicy and sour sauce that seems to include at least chili oil and vinegar and has a flavor profile that is similar to Chinese hot and sour soup. The sauce left my lips and mouth tingling for about 15 minutes after I finished eating these dumplings. I am not quite sure which is better the dumplings or the sauce. The Location: I have been going to the Xi’an Famous Foods location in Manhattan’s Upper West Side, located on Broadway between 102nd and 103rd. Its a small spot with counter space for maybe a dozen people and a sound track of hip hop music programmed by the owner’s son.